Don’t Miss Out on Big Springfield Savings! Sale Prices and $180 in Free Gear for #GearUp Promo! Come in to the Gunz Inc. showroom and shop our selection of Springfield Armory Pistols that are on sale now! Not only are the Springfield pistols on sale, all new pistols purchased between now and 6/30/2017 are eligible for $180 worth of FREE gear for the #GearUp promotion. That’s 4 FREE magazines, a FREE holster, and a FREE dual magazine carrier. 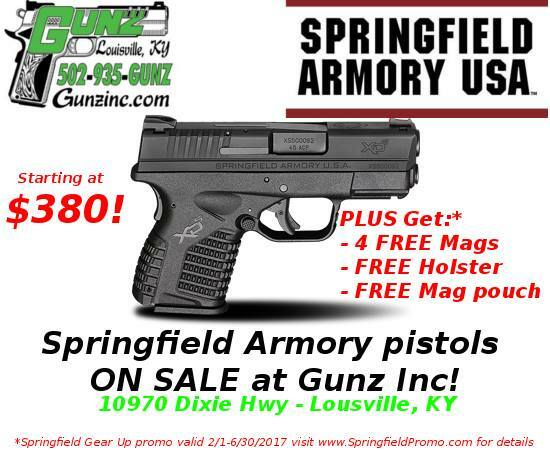 If you have already purchased your Springfield pistol, head on over to http://springfieldpromo.com/ to fill out the online form for your FREE gear. Click here for details on how to submit the form, click here for promotion terms & conditions, and click here for a list of magazines that come with the various Springfield Armory pistols. Don’t forget to follow Gunz Inc. on Facebook and Gunz Inc. on Twitter!